The principal acupuncturist and herbalist of Mount Tai Traditional Medicine Development Center. 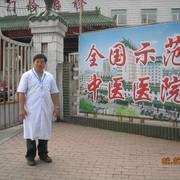 He is a rheumatic musculoskeletal disorders and internal medicine specialist who advocates green medication and promotes the cultural heritage of Traditional Chinese Medicine as his own mission and responsibility. He had attended several provincial and state-level specialist training programs in China.